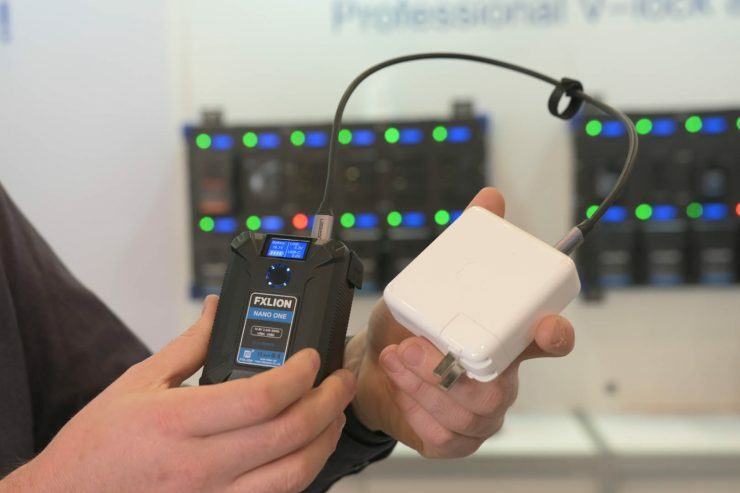 The FXLion Nano One is a tiny V-mount battery available in either 50Wh or 100Wh capacities. 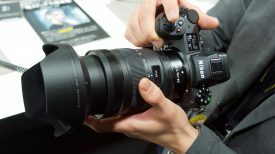 The 50Wh version weighs only 310g (10.9oz). The 14.8V batteries feature D-Tap, USB-A, Micro USB and USB-C ports and a handy display that shows remaining power. 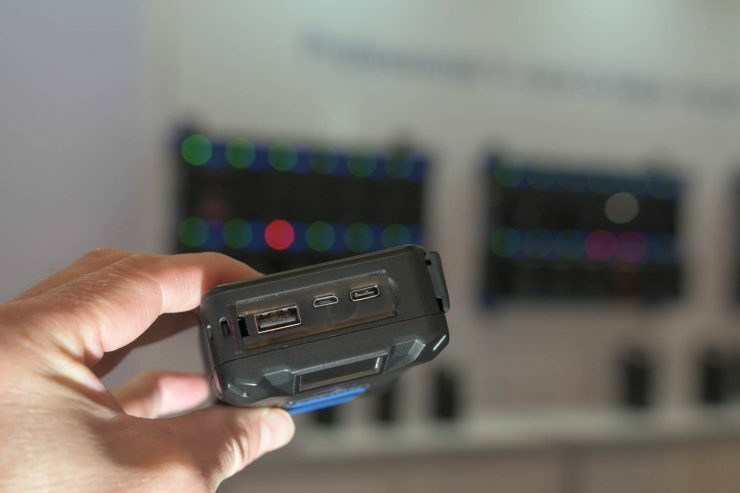 The selection of ports means you can charge the Nano One from a regular V-mount charger or via USB-C. Then you can plug it in to your laptop and use the Nano One to power your computer. This is extremely handy if you’re out and about and don’t have access to mains power. 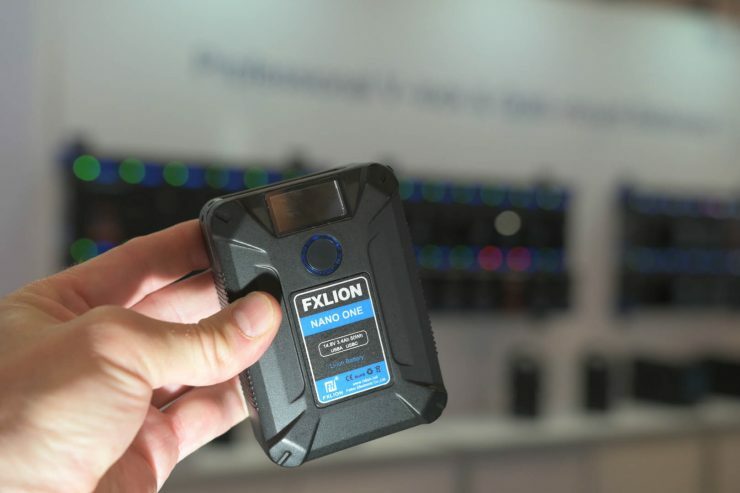 The FXLion Nano One 50Wh battery. You can charge the Nano One via USB – no need for a bulky V-mount charging station. FXLion also make a belt clip for the battery. Ports L to R: USB-A, Micro USB, USB-C.
V-mount/Gold-mount batteries have been getting smaller and smaller recently but the Nano One is one of the smallest we’ve seen – comparable to the Hawk Woods VL-M50. It looks like the Nano One could be a really useful addition to your bag – you could use these to power everything from your lights to your computer. 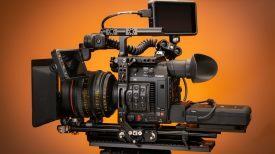 And as well as their small size, if you’re on location there’s no need to take a bulky V-mount charger with you. You’ll also be able to take both capacities onboard aeroplanes without worrying – they’re under the threshold for carrying in hand luggage. You’ll be able to take up to 20 (!) 50Wh batteries with you on the plane. Two small capacity batteries make one medium capacity battery. 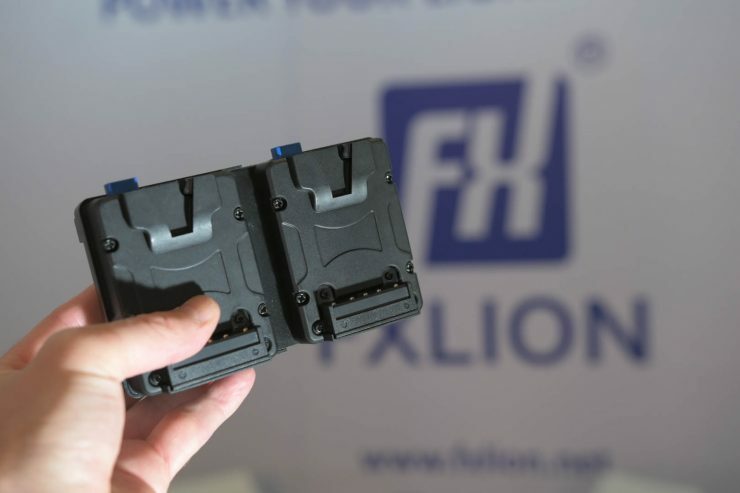 FXLion also have a range of battery plates available including a dual battery version that you can use to combine two batteries. 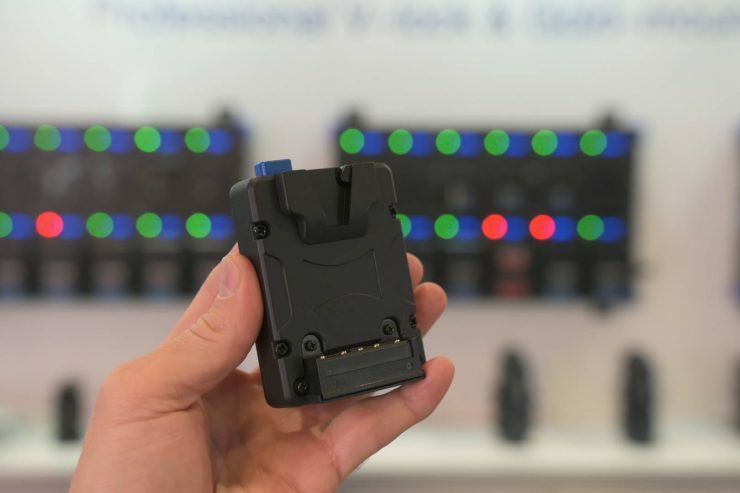 Currently the battery plate discharges both batteries at the same time but FXLion are looking into a solution that will allow you to hotswap batteries for extended runtimes. The FXLion Nano One 50Wh battery should be shipping shortly for around $190 US. There’s no price or availability yet on the 100Wh version. 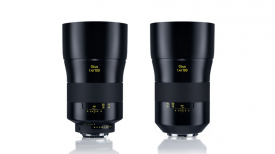 Currently FXLion don’t plan on making higher capacity versions of the Nano One.